We are happy & proud to say that we received “Institute of the Month ” Award recognition. Q1. Tell us something about AAN CAE Technologies. When and how it started? Ans. 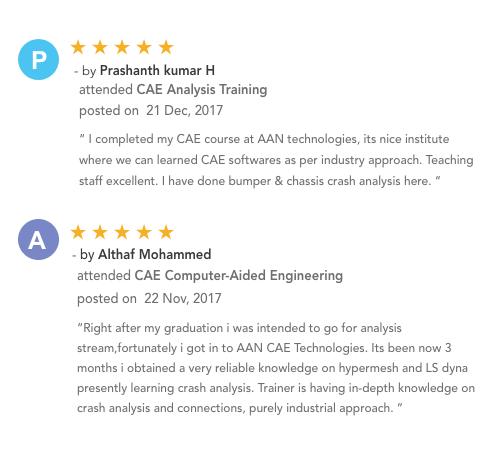 AAN CAE Technologies is a Crashworthiness training institute established mainly to bridge the talent gap between Meshing Engineers & Dyna Analysis Engineers. The institute was started under the Crashworthiness Domain Expert Syed Shuaib Ahmed Darvesh in 2016. The institute has helped many professionals to upscale their Crash Analysis skills. Syed Shuaib Ahmed Darvesh is the Crashworthiness Domain Expert who has 11 years of CAE experience and majorly supported USA Automotive leader General Motors (GM) for more than 6 years (Direct + Indirect employment). In his successful span of 11 years of experience, he has successfully executed more than 1200 meshing projects, 200+ vehicle Assembly projects, 100+ Vehicle Integrations projects, 50+ Full Vehicle Sync FMVSS Crash Analysis. In General Motors Chevrolet, he supported & successfully executed the FMVSS Safety regulation. He is very much Proficient in CAE Tools Like Altair HyperMesh, HyperView, HyperGraph. LSTC LS Dyna, LS Prepost. GNS Animator. Oasys Primer. MoldFlow Plastic Insight. ESI Group Visual Mesh. Q2. What are the major coaching categories your institute offers? What is the USP of your institute and how satisfied are your students? Ans. Our USP is to train thoroughly the engineers in such way that they can upscale their current meshing skill to assembly work or Vehicle Integration work or FMVSSS Crash regulations work. We follow OEM holistic approach to solve full vehicle crash analysis load cases. Our Trainee Engineers are extremely satisfied with syllabus and training approach. Some of them started doing analysis work in their current company and most of them are able to crack the Dyna or Crash analysis interviews in crash analysis companies like Autoliv, L&T, Xitadel, HCL, Easi, Mercedes Benz, Johnson Control, Tecosim, CSG, CSM, Ford, Nissan, Altair, RLE etc. Q3. How UrbanPro.com helps your institute to stand out from competitors and generate more revenue? Ans. We must admit that UrbanPro’s leads have really helped us to establish our institute immensely. We are happy to associate with UrbanPro. It’s a really a good platform for trainees as well as for trainers. Q4. What percentage of your institute’s work comes from UrbanPro.com? Ans. We receive around 30-40% of our revenues through the UrbanPro platform. Q5. What do you think differentiates UrbanPro.com from other platforms? Ans. Membership cost is reasonable and Staff Support is excellent. Thank you UrbanPro! Q6. What would be one piece of advice that you would like to give new Institutes listed on UrbanPro.com? Ans. Be honest in your commitment to the trainees and go extra-mile in satisfying the same.